Being able to recognise the small signs could mean that you are able to undergo technical surveillance counter measures before any vital information is taken. Among the key indicators to look out for is the presence of seemingly empty service or delivery vans close to your building, this is especially true if the van is difficult to see into because of tinted windows or concealed areas where people could be sitting to listen in on your meetings. Take a similarly cautious approach with utility, phone, TV or cable repair vans that seem to be working in your area, but achieving very little, if any, actual work. The same level of counter surveillance care needs to be applied to work orders that you were unaware of. A fake power outage or fire alarm test is a perfect way of gaining entry into otherwise out of bounds areas of your building. It is not just the presence of people that should raise concerns. If you receive gifts, particularly electrical gifts such as alarm clocks, desk radios, or even a mobile phone, you should be very suspicious. But, don’t assume that an unsolicited gift of a pen is any safer; even these are big enough to fit a spying device in that would lead to the need for a TSCM service. These are just some of the key areas that we at Advanced Sweeping recommend our clients are aware of. 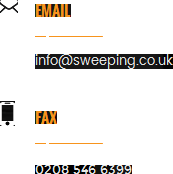 If you have concerns and need a TSCM sweep, then call us today on 0845 512 1552 or check out our other tips for keeping your business safe, available at http://sweeping.co.uk/.